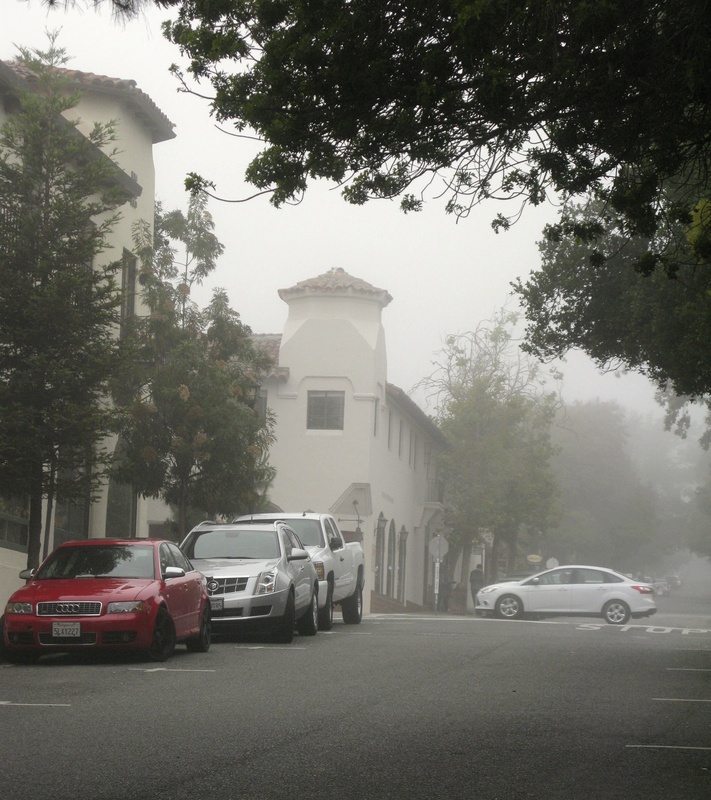 In the twenty years we have been coming to Carmel, we have yet to see much fog. 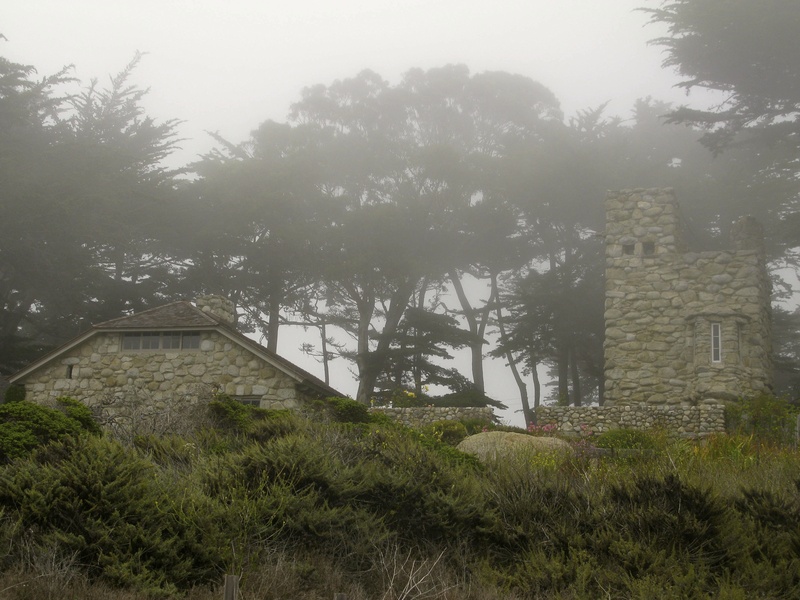 As a photographer, I dream of a chance to shoot on a foggy day when all things are transformed into the mystical. This trip I am not disappointed. I am leaving a Bach concert at the church near our house and there it is, FOG, dreamily drifting up the street, weaving between tree branches and twirling around the cottages. I race home to get the camera and start out. I head down to the beach and walk along Scenic Dr. Sounds are muffled. 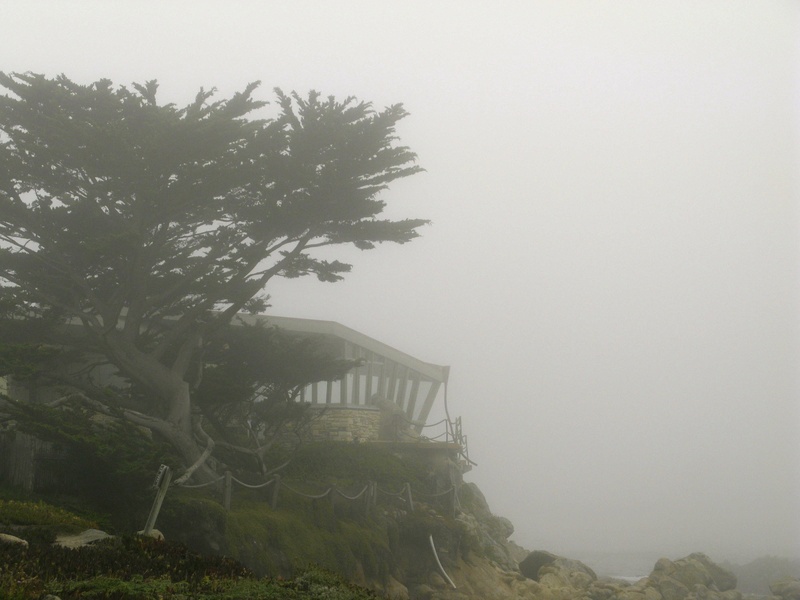 Sea Urchin and Periwinkle hunker down under the fog- shrouded Monterey Cypress. 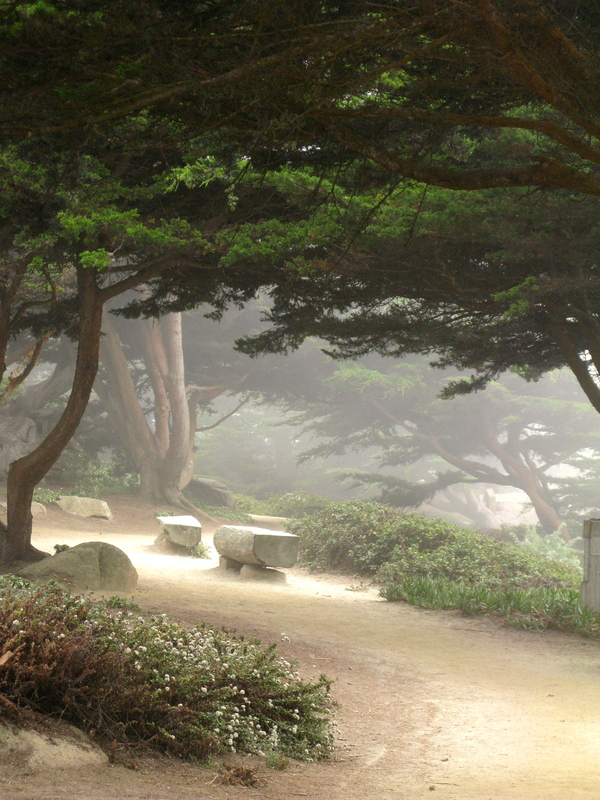 The Cypress survive here because of the cool, moist fog. 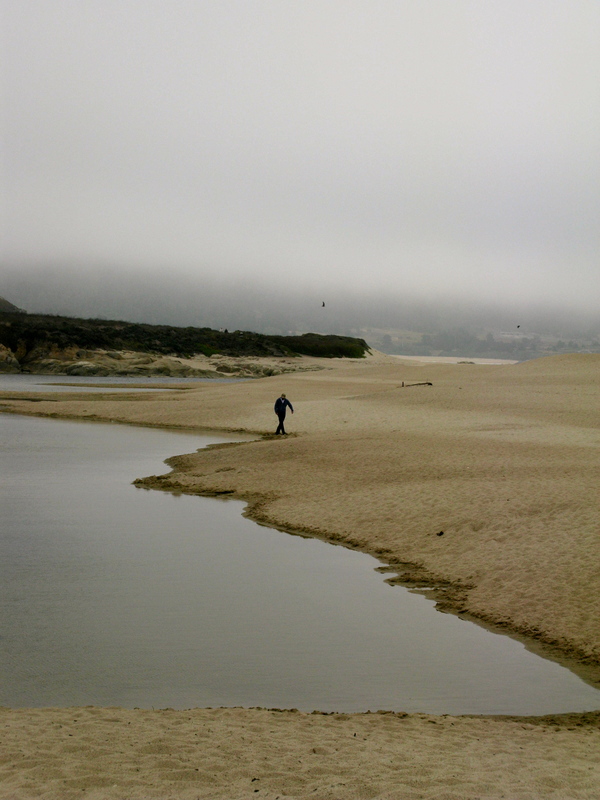 The beach ,which was so crowed yesterday ,hosts only a few brave souls. 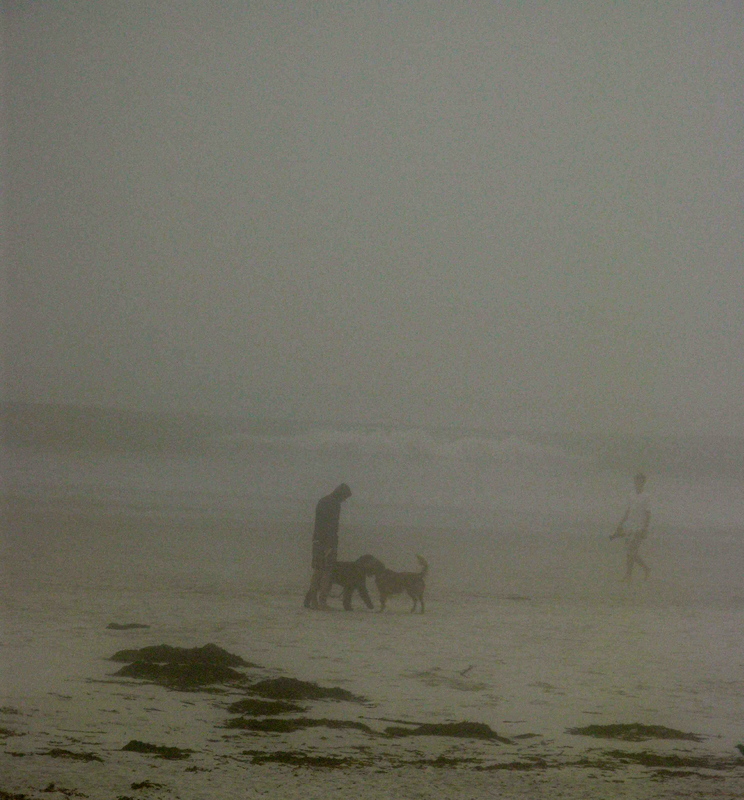 The dogs are not deterred by a little fog. I hope this party is just over and not just starting. The caterers are packing up. This is so beautiful. Just what I was hoping for. The homes no longer look so familiar. 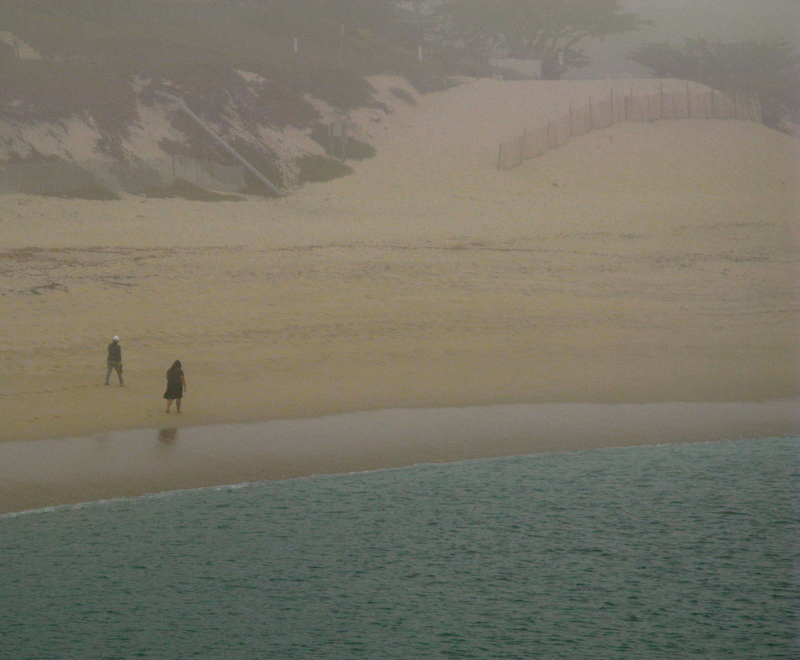 The newcomers look slightly surprised by their cloaks of floating fog. 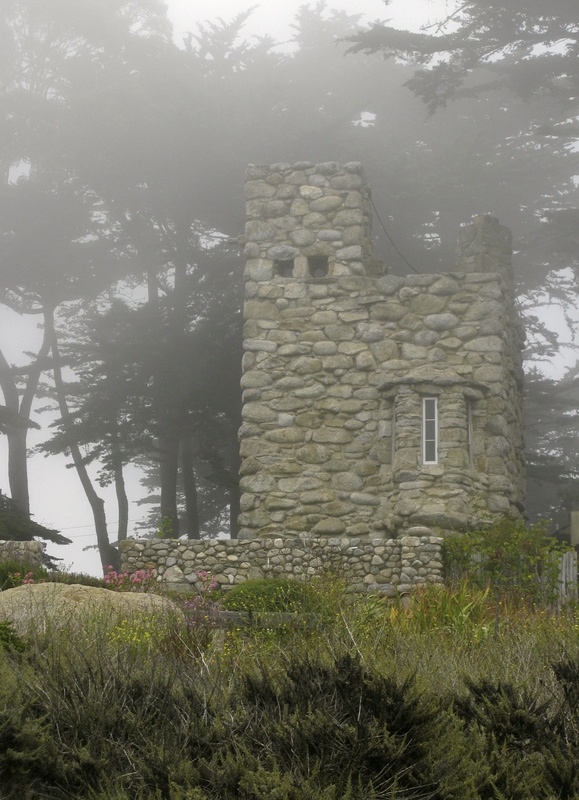 Teddy Kusters’ cottage looks like a fortress against the weather. The Butterfly House clings to the shore, enduring. 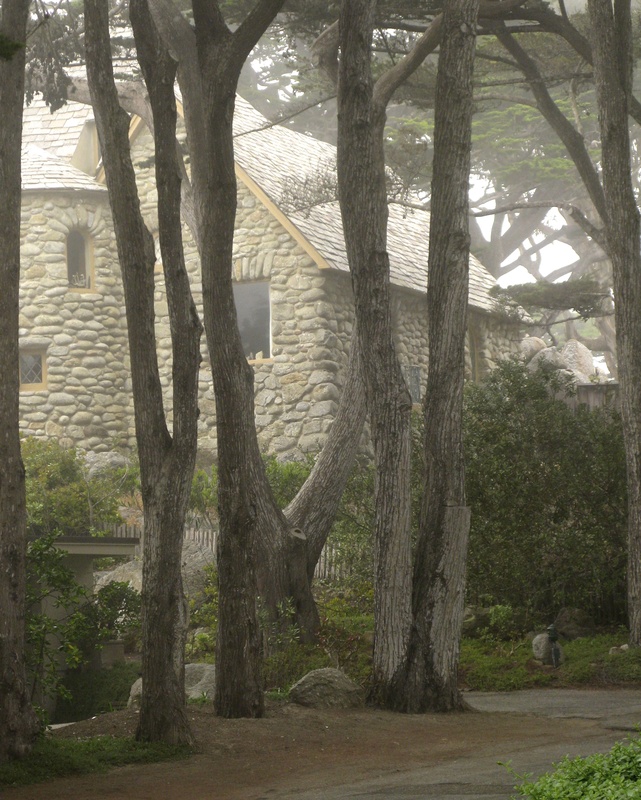 Tor House was built low and squat so the fire could warm it against the chill fog. And the foam on the shore granite. 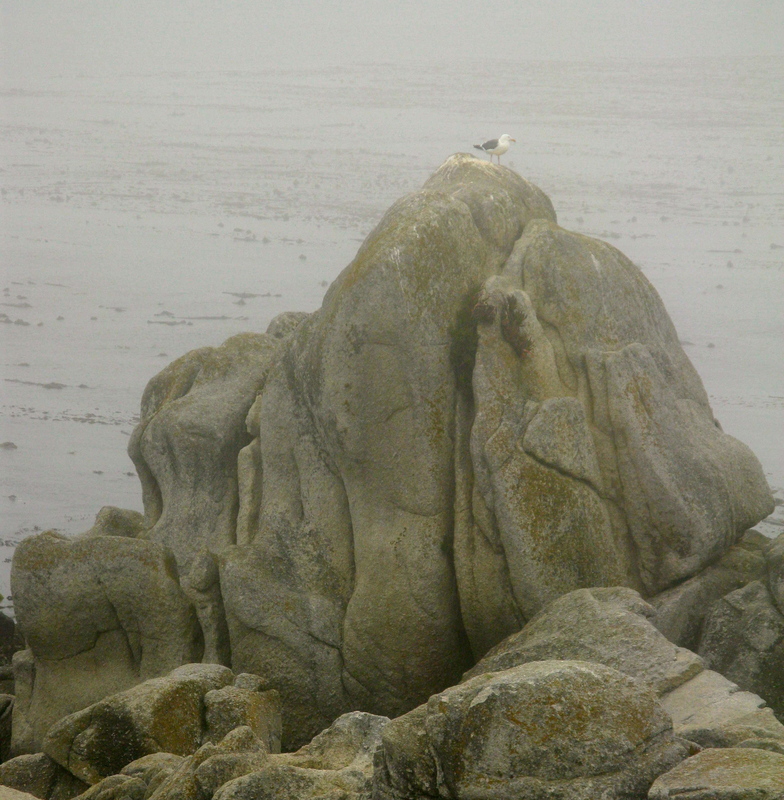 A solitary gull stands guard. 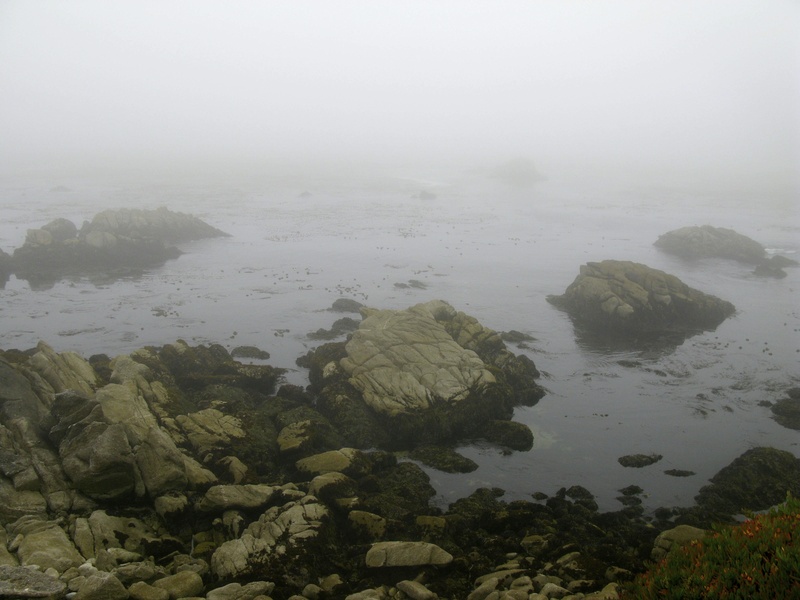 Point Lobos has become invisible. 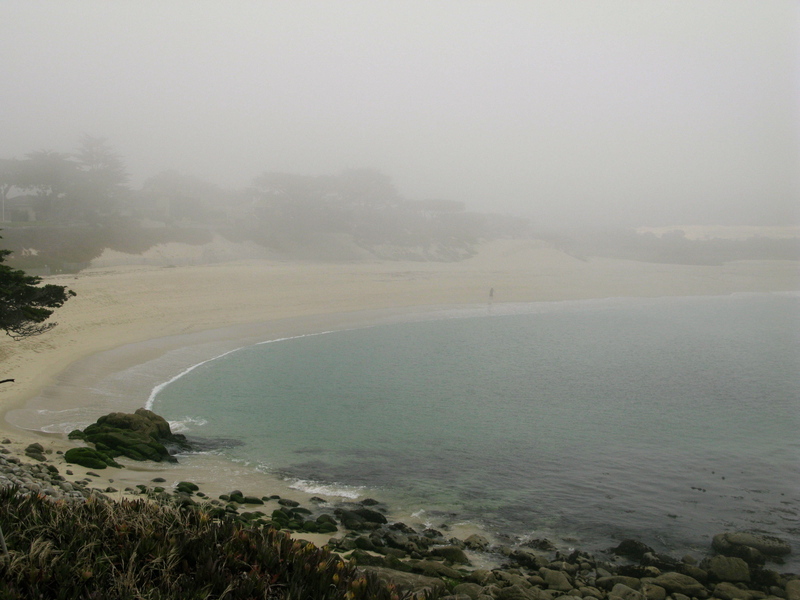 Still, Carmel Beach is lovely. Back in the Village, life goes on as usual. 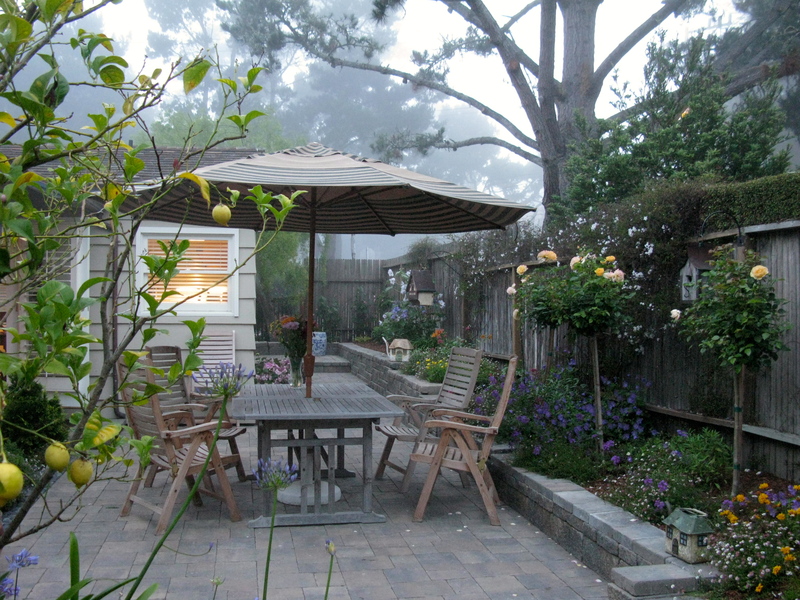 I am up early the next morning hoping to catch the fog sneaking around in my garden before the morning sun chases it away. It is drifting away as quietly as it came. 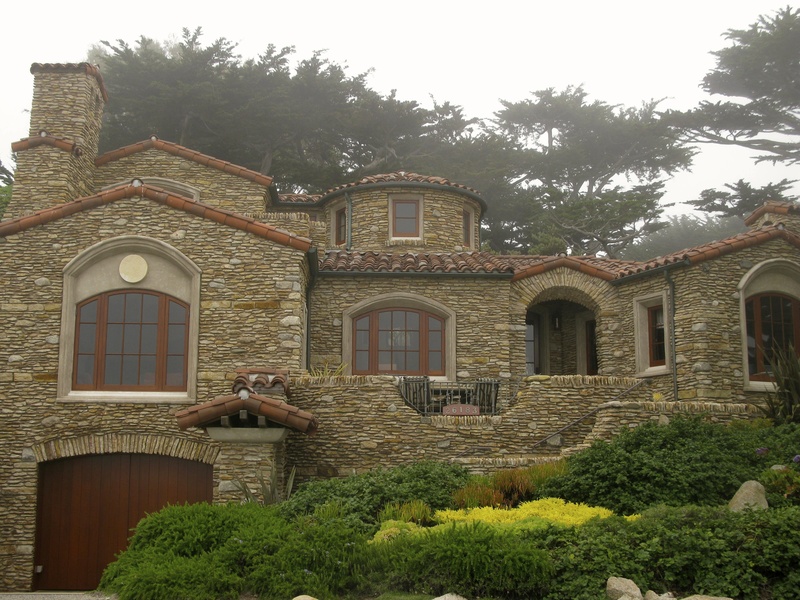 I grew up in Carmel, as my parents owned The Homestead. I left there in 1972 and these pictures bring back so many wonderful memories. Thank you for posting them. 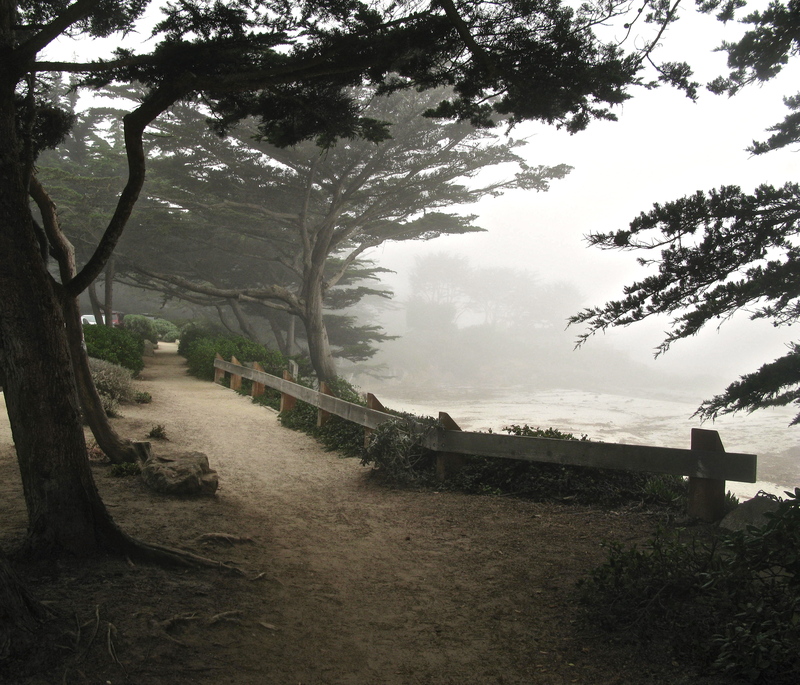 Beautiful photographs that truly capture Carmel, and I love the poetry as well! Incredible images and a favorite poem! 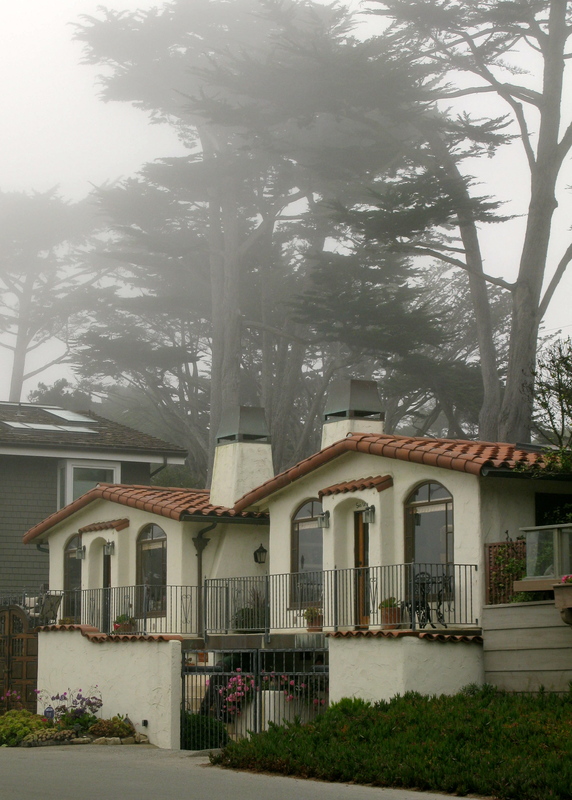 I LOVED this day – the fog highlighted how surreal this magical year has been for me. Thanks for the wonderful photos!! It was special, wasn’t it? Just when I was whining about the fog you make all very magic again. 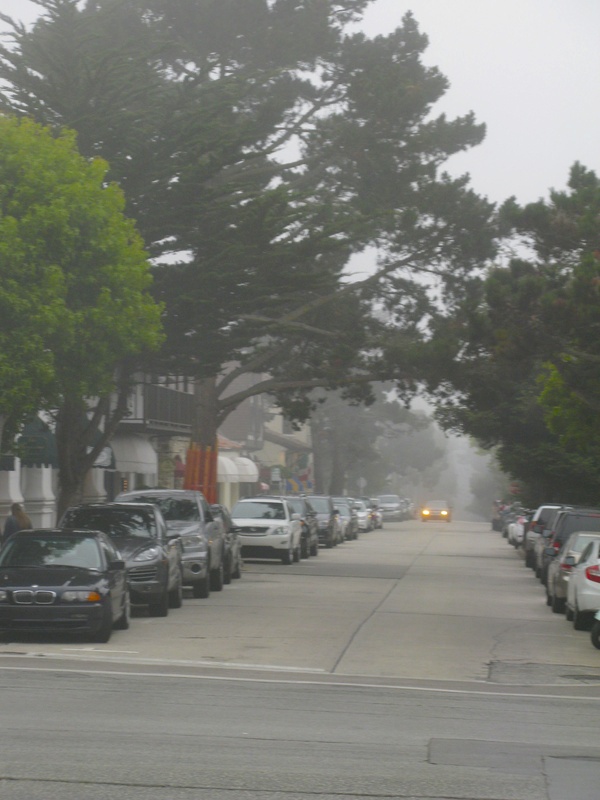 Fog in Carmel is probably like snow in Kansas City. Beautiful beyond words the first day, less so the second day and by the third day you have had enough fun to last all year! Love it! Thank you so much for each edition. We’re back in Austin, TX enduring 106 degree afternoons and dreaming (and envious) of your Carmel experiences. Please keep them coming. Ahhhh, I feel like I’ve cooled off ten degrees just scrolling through these enchanting pictures. It was 88 degrees here in TX out on my veranda a few minutes ago – at 9PM! 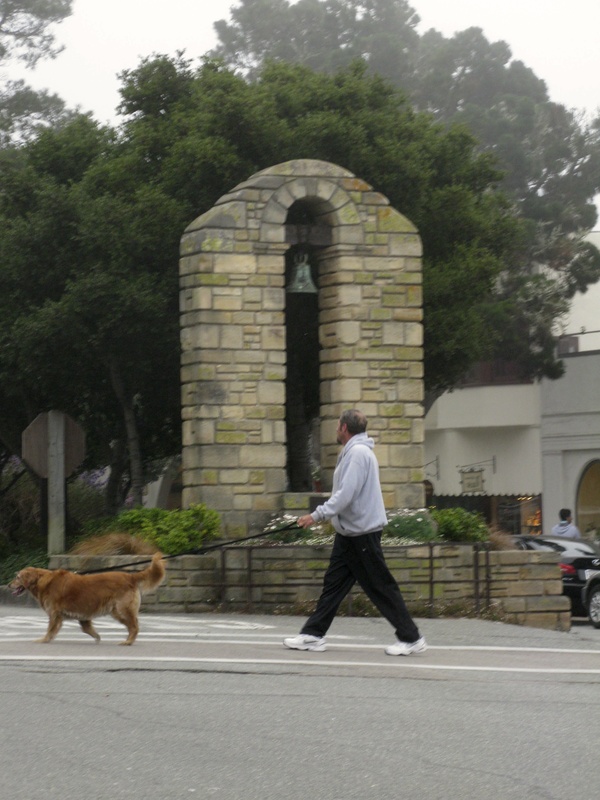 Actually, per Wunderground, the downtown station at Carmel-by-the-Sea is currently 60.3 so I guess I’ve really cooled off 28 degrees, haven’t I! Absolutely gorgeous, Linda. Thank you so much! Beautiful. One of my faves! breathtaking photos, linda. I would kill to be there. Thank you for chronicling your beautiful community . . . I love being transported back to scenes from my childhood and places that are dear and even sacred to my heart. I hope you don’t mind that I occasionally pin your images (with credits) – I’m sure they bring joy to many people. Really lovely. Wish I was there. Loved the pictures. I look forward to the day I can go back and stay a few days. My husband and I drove down for the day 2 years ago while visiting San Francisco. 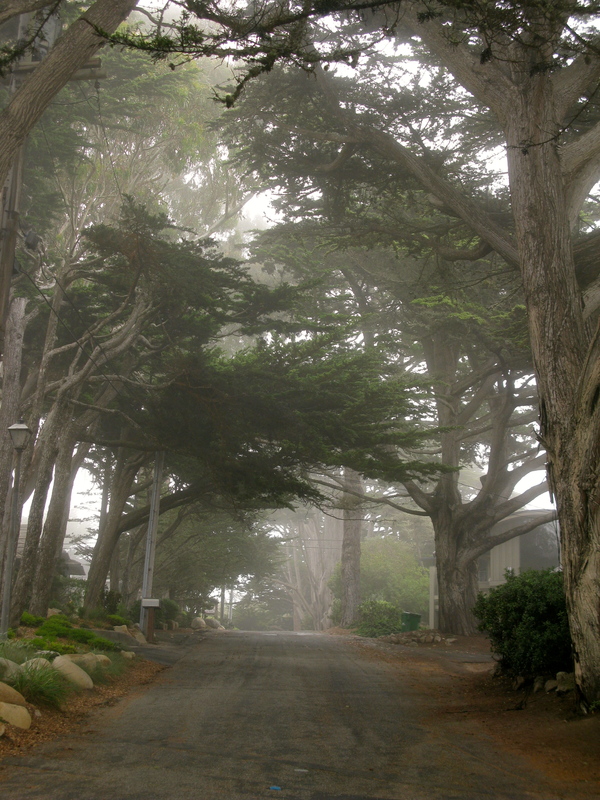 Carmel stole my heart though. Linda, so ethereal and lovely. Several of your photos were so beautiful, they nearly brought me to tears. Thank you for a wonderful post! 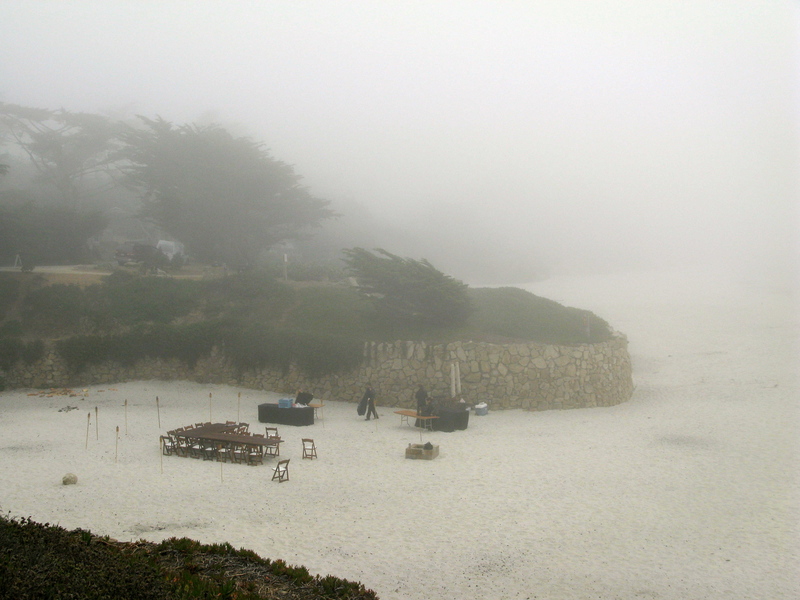 I remember when I came to visit Carmel for a few days in 2007. It was a longed for visit that I will never forget. 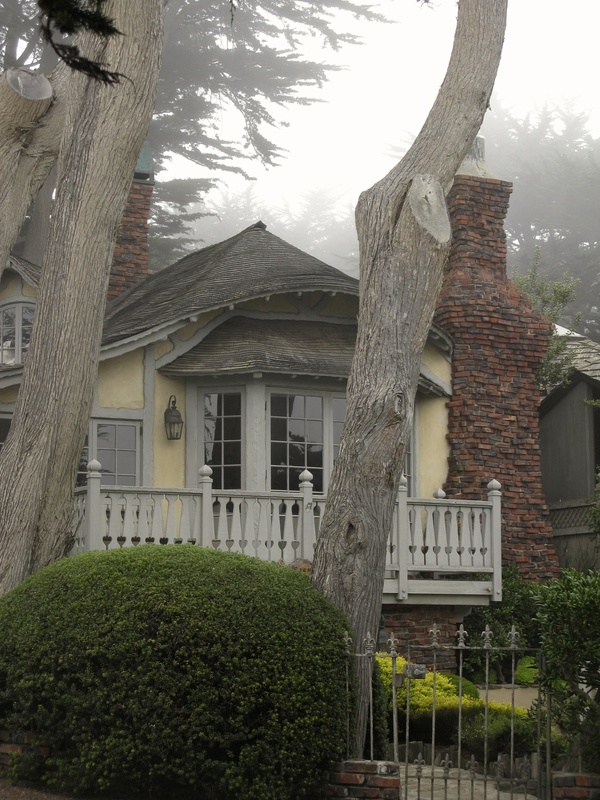 That first morning I was out with my camera in the fog, but I did not capture anything quite as magical as your collection. Thank you so much for sharing your lovely images. 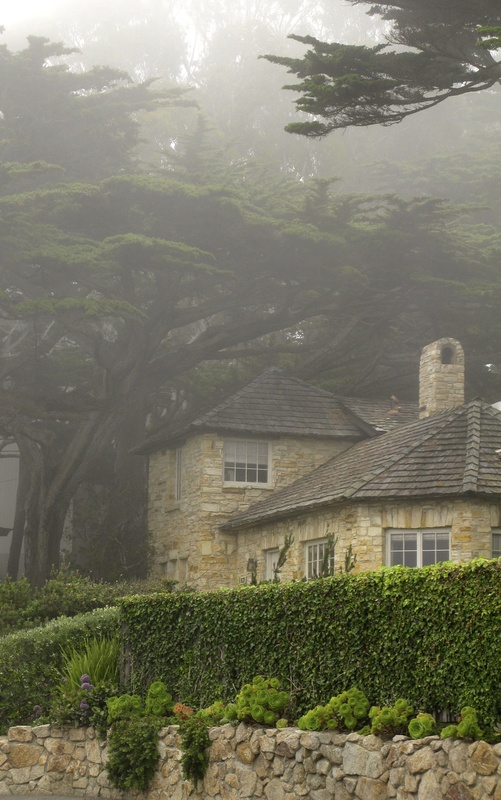 The fog makes everything look so romantic! I loved seeing a bit of your garden too! I loved all your pictures today! 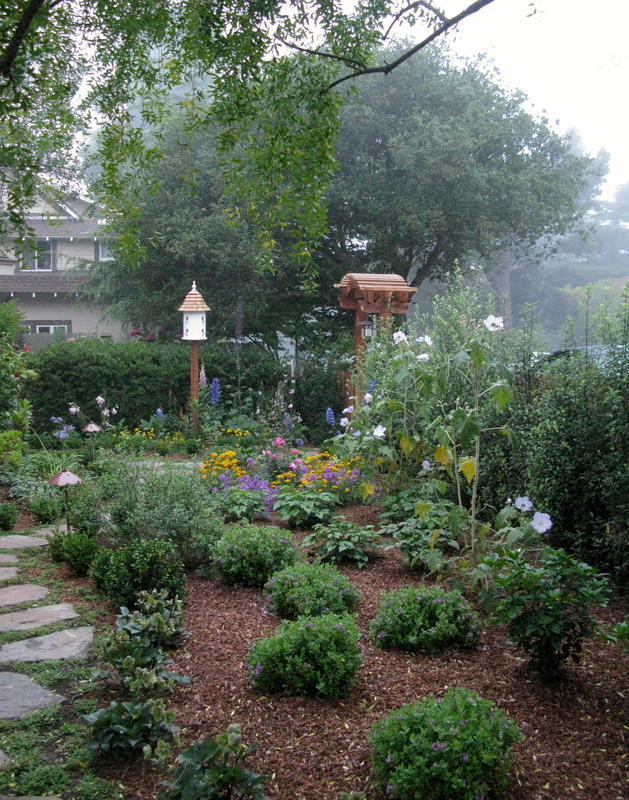 And your flower garden is gorgeous! 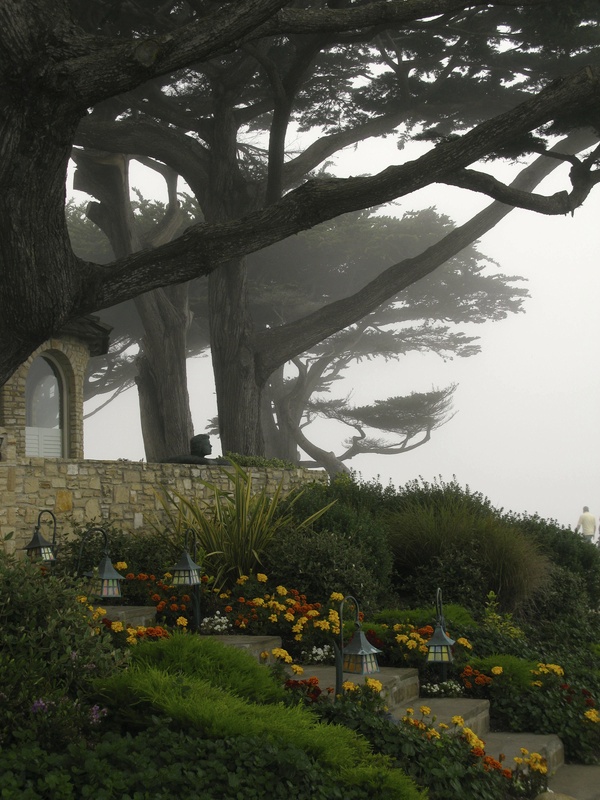 I hope to come see your Carmel one day in person….it is so beautiful! Somehow I ended up here via a link I followed (I think) from The Provencal Faerie Hearth’s page. 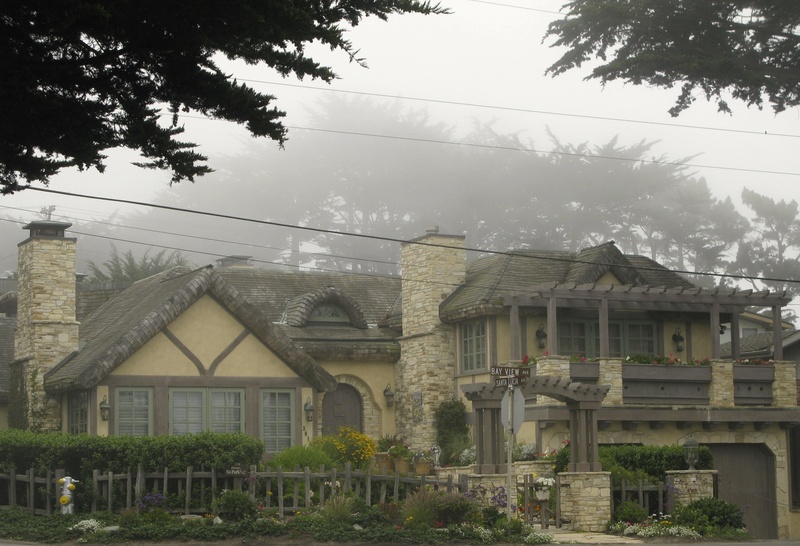 I cannot even fathom how heavenly it must seem to live in a perpetual “make believe world” with all these wonderful cottages, perfectly placed flowers, trees & shrubs, in quaint town by the sea. I would never ever want to leave!! Thank you for sharing this wonderful place that most of us can only dream of! !